Here we are in St. Peter’s Square! What a morning. We were told the audience wouldn’t begin until 10:30, so we thought we could sleep in a little — not so much. In order to get a seat, they recommended we arrive between 6:30 and 8:00 am. Everyone has to go through security, all 50,000 of us, so it was a little chaotic. Luckily, we got through without any problems and were in our seats by 8:30. Also luckily, it was an incredibly beautiful fall day. The sky was brilliant blue and the breeze had just a hint of chill in it. We were told to expect the world’s biggest Catholic pep rally, and that describes it pretty well. The mood was festive and everyone was having a good time. Since we expected it all to begin at 10:30, we were surprised when they actually started around 9:45. 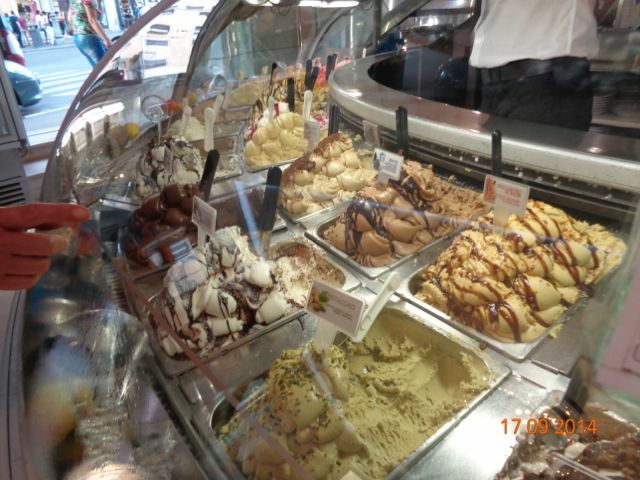 I always thought things in Italy could be late, never that early! It started with announcements of all the groups that were there. Then, the Pope whizzed up and down the aisles in his suped-up golf cart. It wasn’t the same as the popemobile, but close. He stopped often to kiss babies and accept gifts from the crowd. At one point, he accepted a drink from the Argentinians in the crowd. I have to say, it was surprise to see people passing their babies from one person to the next to get them to the Pope. We were told that if someone hands us a baby, don’t drop it! And pass it to the Pope or one of his guards. I was more concerned with passing the little ones back–how do you know who the mother is? It was charming to see the slightly older babies (around 1 year) screaming from the stranger anxiety and Pope Francis consoling them. Okay, here’s the scoop that all our family and loved ones need to know. 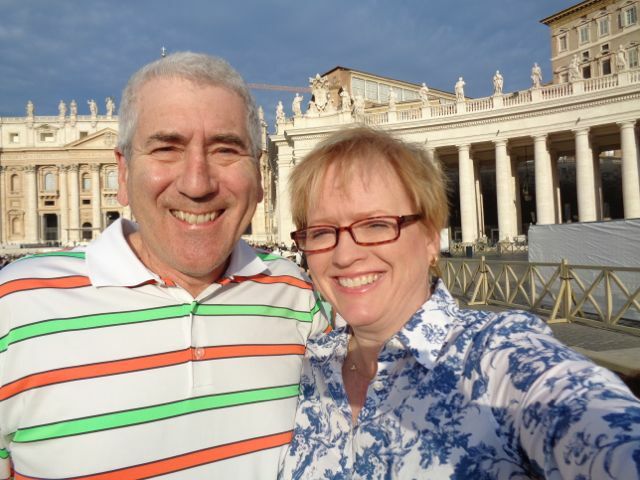 The Pope’s blessing that Bob and I received extends to you, too! (It even counts if you’re not Catholic!) That is especially true of any of you who are dealing with illness. So, consider yourselves blessed! Below are a couple of pictures and I’m going to try and include a couple videos. I’ll explain them below. Here he is! I didn’t even have to zoom in, we were actually this close to him. He was so cheerful, I can see why the world has fallen in love with him. 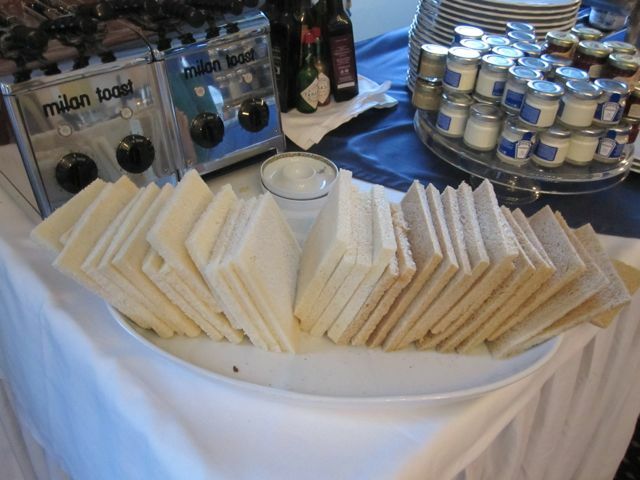 We were certainly impressed. 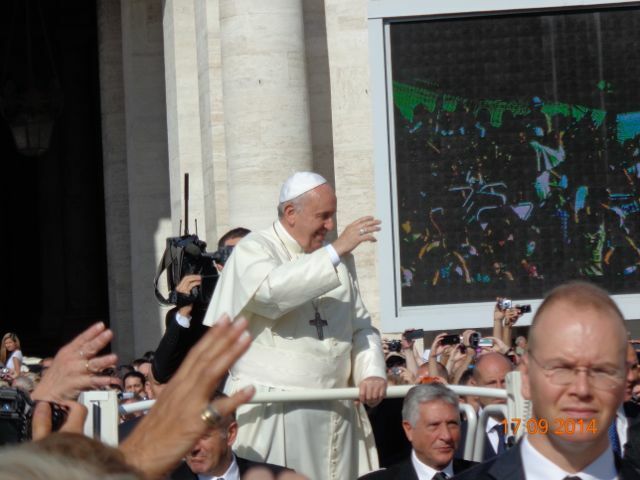 Being part of the papal audience is one of the highlights of my life. I’ll never forget it. In the mean time, here are some pictures of the place where we stopped for dinner. 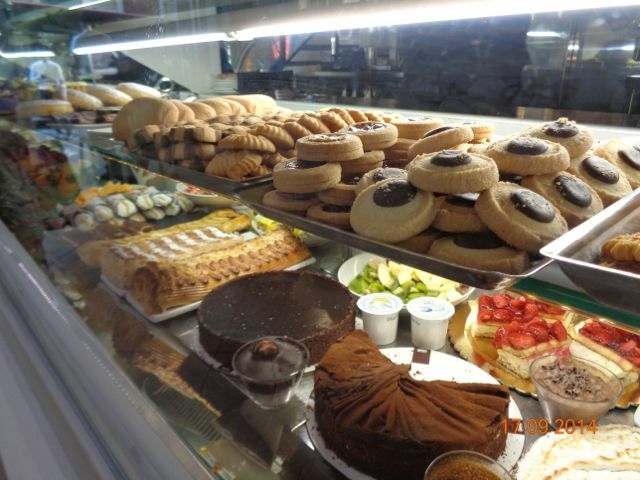 Everything was so beautiful and tasty! This was a wrapped sandwich, almost like a pita or even a burrito. 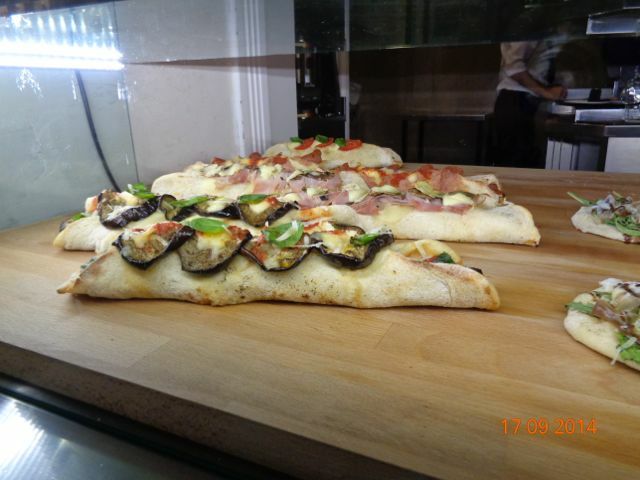 In Italy, the next closest thing might be a stromboli, if a stromboli wasn’t hot. It had sliced eggplant on top and looked incredible. 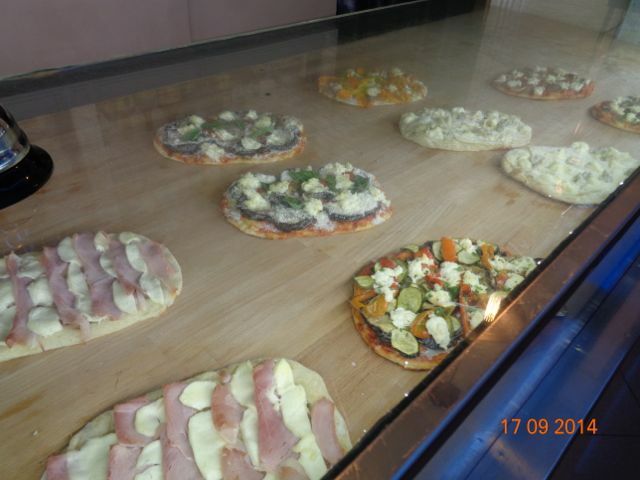 These are just some of the pizzas they had available. It is so weird to find sliced potatoes on a pizza. Another on the menu had sliced pumpkin. Well, what a day. We started out about 8:30 am on a tour of the Vatican Museums. We didn’t even begin to see it all, but we saw all the best stuff, I think. The ceilings, walls and tapestries were incredible. There are many other examples of such “jokes.” Like how Michelangelo used the face of his mistress, whom he’d just broken up with, for one of the damned souls. In another, he used the face of one of his critics for one of the inhabitants of Hell. 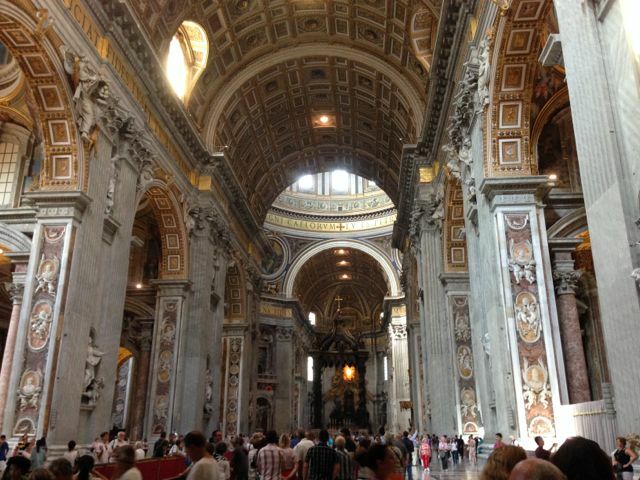 After the museums, we went to St. Peter’s Basilica. It was huge, and quite beautiful. The burial areas were interesting. 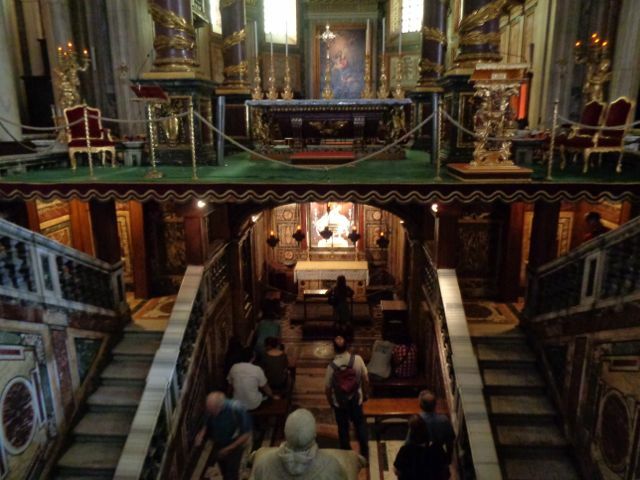 We saw the tomb of Saint John Paul II, and the preserved body of Pope John XXIII, who is also now a saint, I think. In his case, he was one miracle short, so they couldn’t make him a saint. But, when they opened his tomb, they found his body was uncorrupted, so they considered that his final miracle for sainthood. They have him on display in a glass coffin. I know, it’s a little weird. 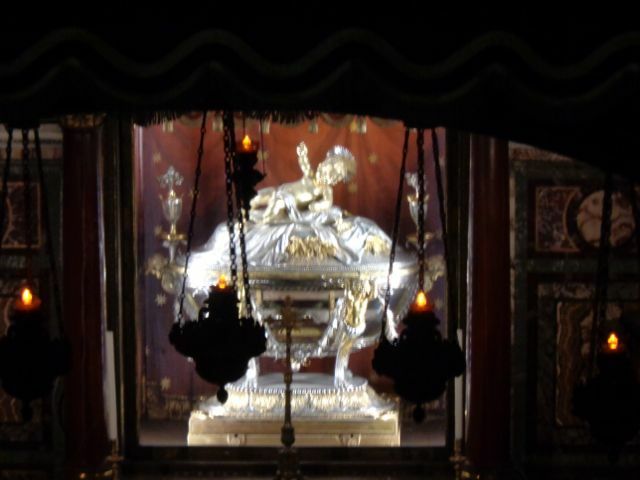 Other popes were also in glass coffins, but their bodies decayed, so the body you see was coated in bronze to preserve them. Again, a little weird. I only viewed them from a distance. After lunch, we took a tour of three other basilicas in Rome. The first was St. Paul’s, which is a new (completed in 1930’s) replica of the one that was built by Constantine, restored a couple of times, and then and then burned down in the 1800s. There, we saw one of St. Paul’s relics, the chains that bound his hands when he was beheaded. 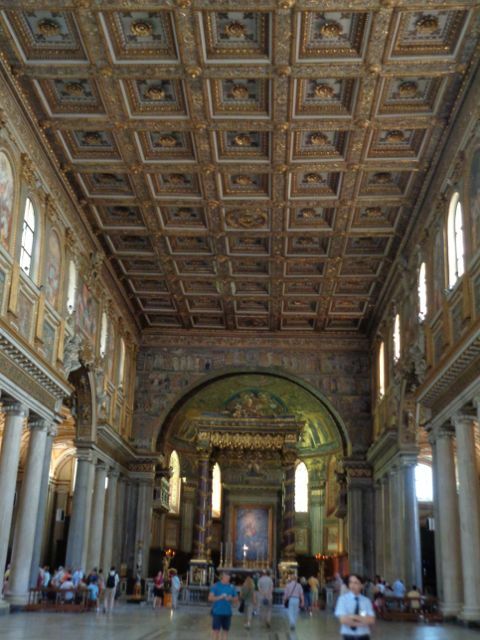 Next was St. John Lateran. It was built in honor of the two St. Johns (Baptist and Apostle) and it was built by Constantine on land formerly owned by the Laterani Family, thus the name. It’s been restored several times. It is actually the most important church in Christianity because it is the home church of the Bishop of Rome, aka, the Pope. Up until the 1300s, the Pope lived at this church. 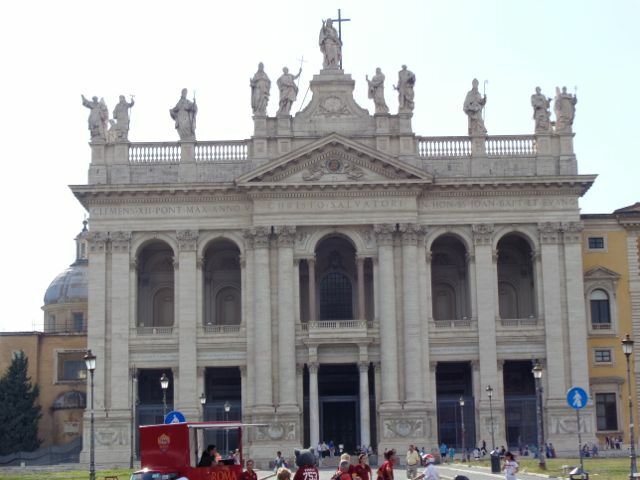 The popes didn’t move to St. Peter’s until a hundred years later, after they moved the papacy back to Rome from France. Interestingly, after a Pope is elected and introduced to the world on the balcony, he isn’t yet the pope. 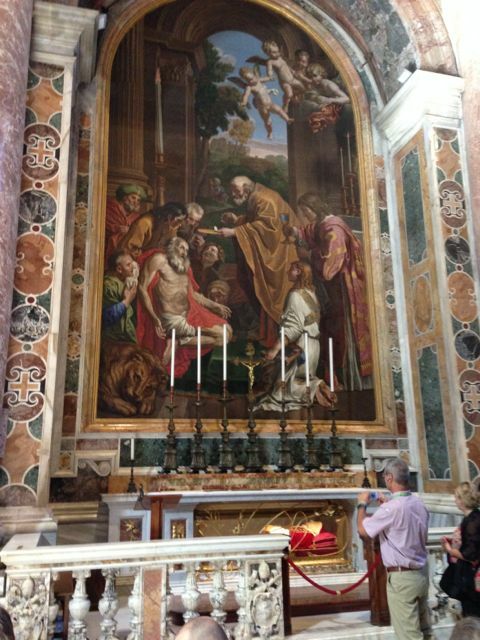 It isn’t official until he says Mass at St. John Lateran, and sits in the Seat of Peter (a chair more than 1000 years old). Traditionally, the pope leaves the balcony after meeting the crowds and heads right to St. Johns to complete the process. Pope Francis did it differently. He told the people of Rome he wanted to get used to being their bishop before he took on the job of Pope, and it was about a month before he went to St. Johns to complete the process. The Romans really, REALLY love Pope Francis. Across the street from this church is a building that holds the original stairs to Pontius Pilate’s house that Jesus had to climb after he’d been crowned with thorns. Supposedly, his blood stains the marble. 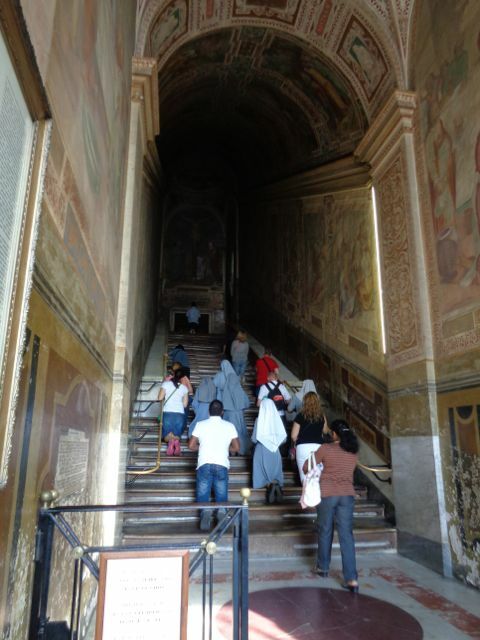 Today, it is a place where people climb the stairs on their knees and they have to say at least three prayers on each stair. The final church was St. Mary Majore. Interesting here is a relic of questionable authenticity. It is claimed that there is wood from the original nativity under the alter here. Even the Church says it’s highly questionable, but it is interesting. 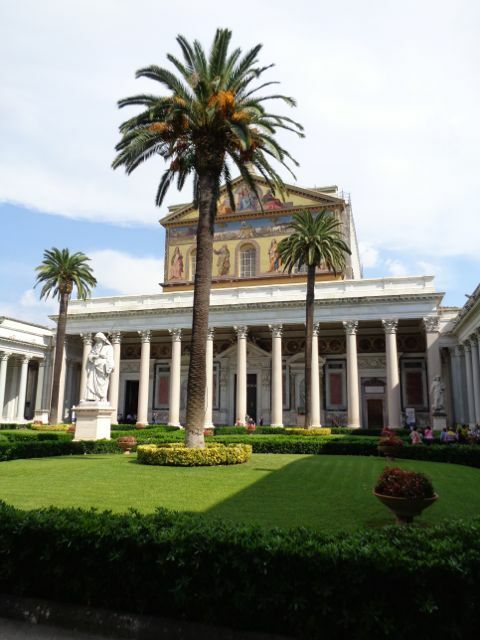 The basilica was built in honor of Mary when the pope declared that Mary was indeed the mother of God. Tomorrow, we have a papal audience (with 80,000 of our closest friends). Stay tuned! It should be a circus! This the exterior of St. Paul’s Basilica. It was quiet and peaceful and the grass was cool in the heat. I could have spent the afternoon here. This is the sacred door at St. Paul’s. 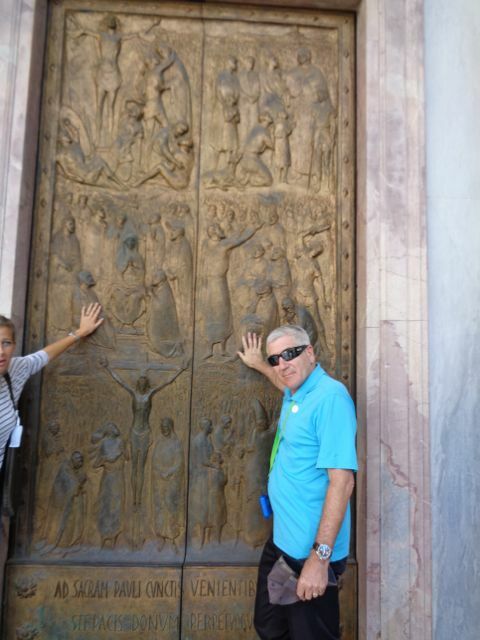 Every Basilica in the world has a sacred door that is only opened during the Jubilee Year. That’s a year that happens every 25 years (the next is 2025) when lots of things happen, but one of them is the plenary indulgences. Anyone who passes through a sacred door during the Jubilee Year receives the indulgence. Believe it or not, the idea of the Jubilee Year was adopted from the Jews in the 1300s. 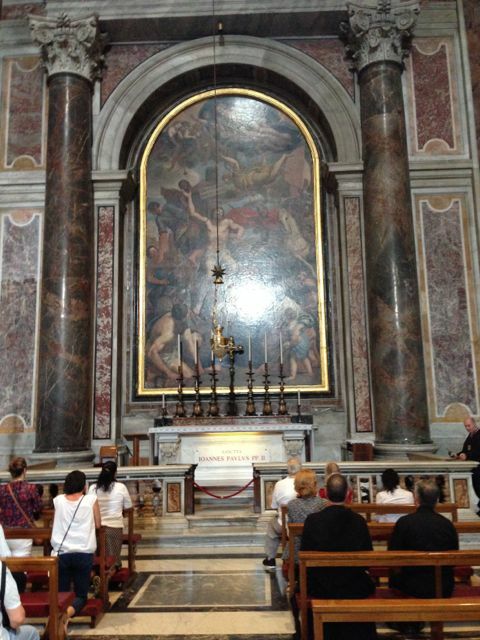 This is the inside of St. Paul’s Basilica. It’s about the size of a football field, maybe a little shorter. This is the alter in St. Paul’s. This sunken area in front of the alter displays the holy relic. In this case, the item on display is the chain that bound St. Paul’s hands when he was beheaded. The authenticity of this relic is very good, and scholars agree that it is probably what it claims to be. 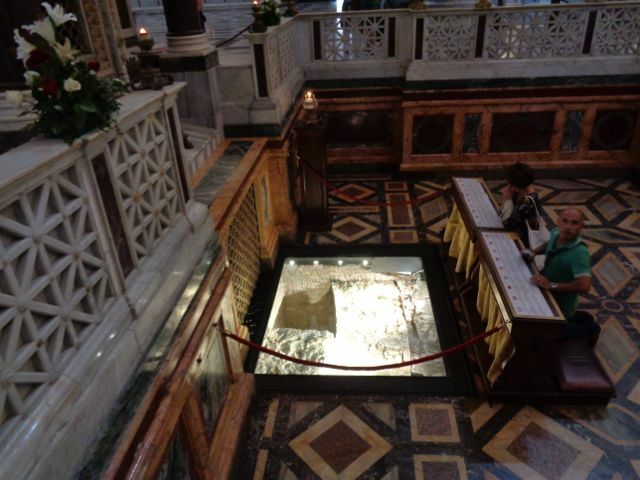 This is a glass panel in the floor, right in front of St. Paul’s chains, that shows the excavation of the crypt below. Based on carbon dating of samples taken, as well as an analysis of the color of the fabric inside the tomb, it is widely agreed that this is truly St. Paul’s tomb. This has only been confirmed since about 2006. 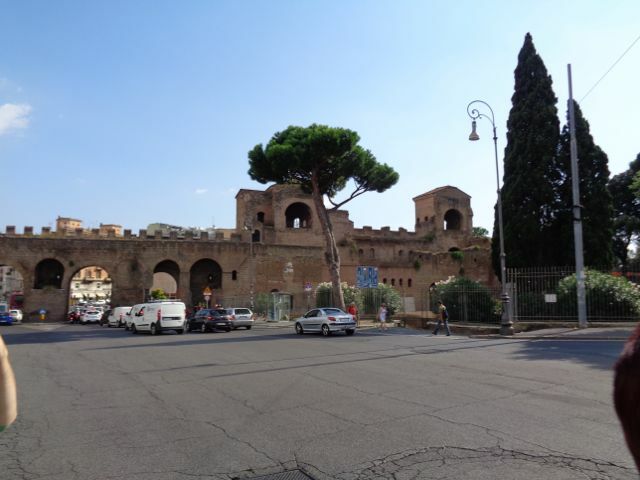 A portion of the walls that originally surrounded Rome. 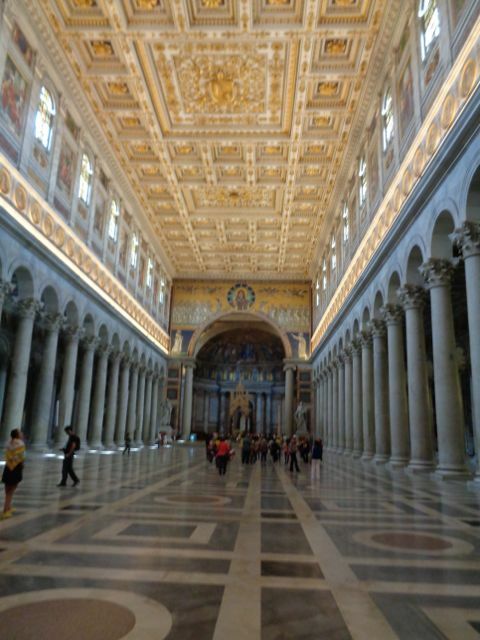 This is St. John Lateran Basilica. 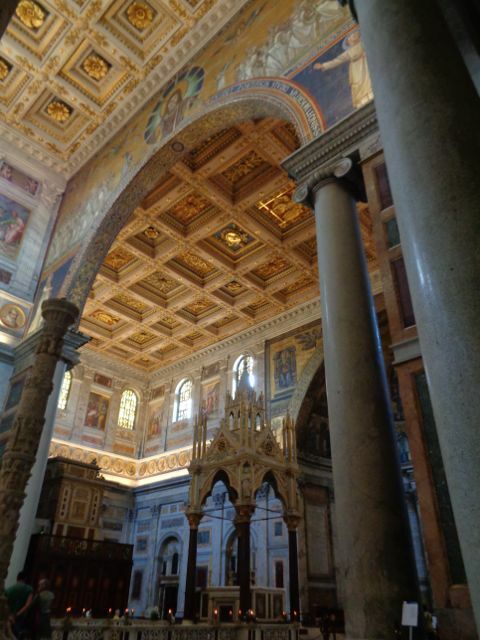 Its been rebuilt many times since Constantine’s original church was built in the 300s. 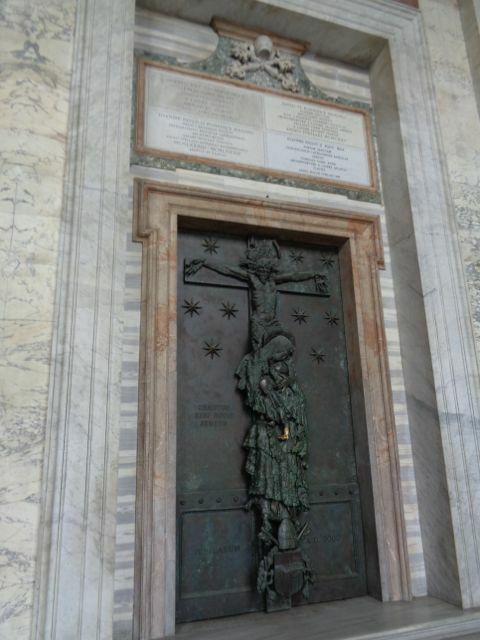 The sacred door at St. John Lateran. Did I mention that touching the door when its closed (not a Jubilee Year) blesses a person? That’s why parts of the door are shiny, its from thousands of people touching it. Of course, we touched them all! 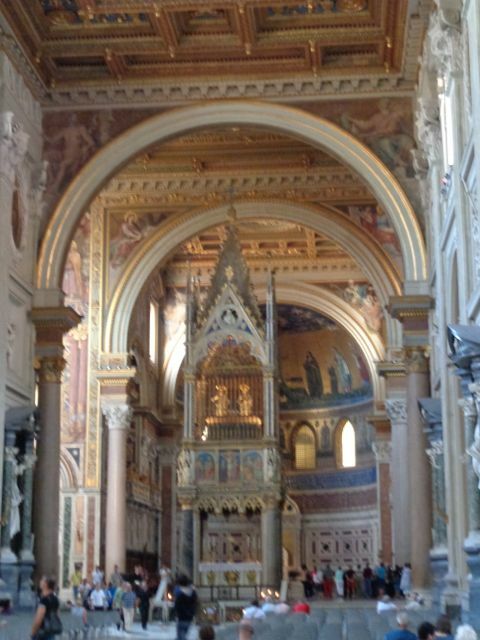 Inside St. John Lateran. 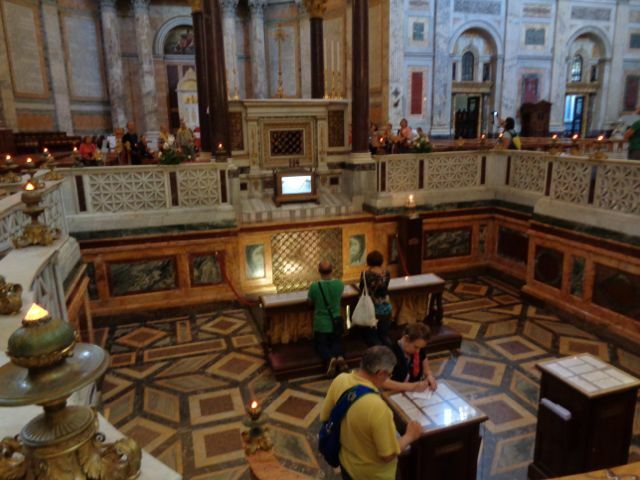 It is thought that the heads of St. John the Baptist and St. Paul are kept in the little room on top of the alter. It’s just speculation, though the Church has apparently confirmed that it is in possession of both heads. I’m just glad they aren’t on display. 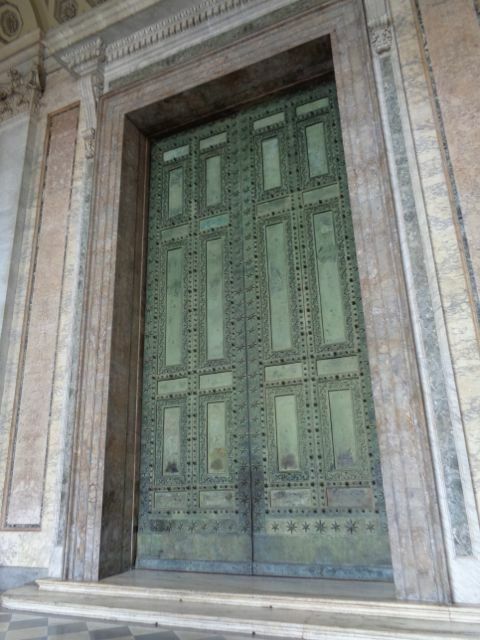 These are the holy doors of St. John Lateran, and they are fascinating for another reason. These are the original doors to the Forum, yes, THAT Forum. During one of the restorations of this church, they were pilfered from the Forum and installed here. So these doors are about 2000 years old. They are made of bronze, with wood interior, but they are very heavy and make loud creaking noises when opened. It takes the strength of several people to open them. These are the holy steps — the marble steps that led up to Pontius Pilate’s house. They were removed from Jerusalem by St. Helena (Constantine’s mother) in the 300s. We were allowed to kneel on the first step only and say a prayer. I’ll admit, it was a moving experience. Even Bob did it. The inside of St. Mary Majore Basilica. According to our guide, Italian men are mama’s boys. Perhaps that’s part of the reason why 89% of Italians report they prefer to talk to Mary when they pray, followed by St. Peter, then St. Paul (the patron saints of Rome). Jesus was in fourth place. This is the knave in front (and below) the alter of St. Mary Majore. In the window below the altar is a huge silver container that allegedly has wood from the original manger from Christ’s birth. Even the Church agrees the authenticity of this relic is highly questionable. 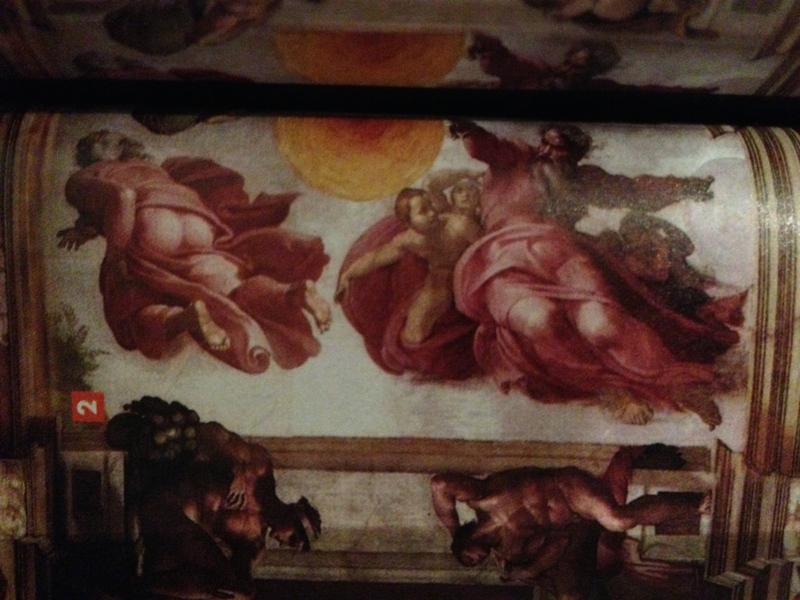 Here’s a close up of the container that holds the wood that was allegedly part of the manger. It looks like a giant soup tureen. It’s about 3 feet tall. 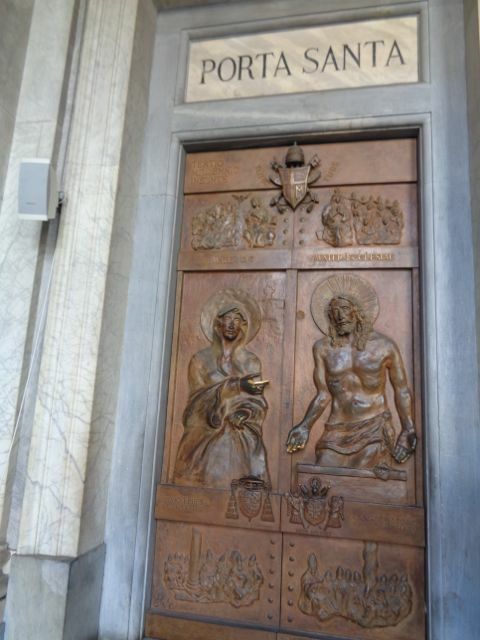 The holy door at St. Mary Majore is clearly marked because it’s on the left side of the main entrance, not the right like all the other holy doors at all the other basilicas. This is because Mary’s place is on Christ’s left, so the door acknowledges that honor. 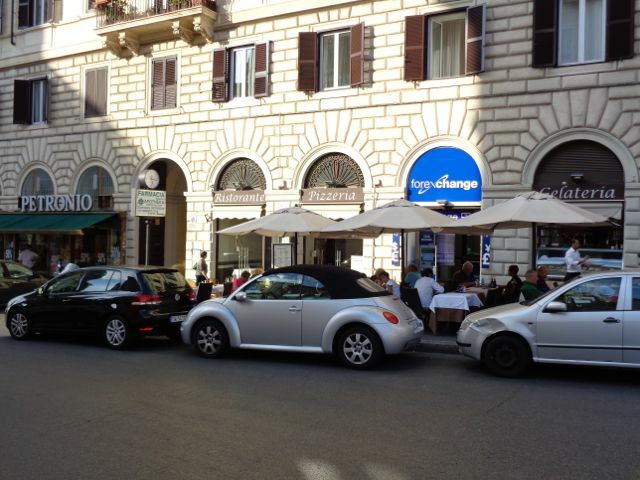 We found Saya’s car in Rome!!! This made me laugh. 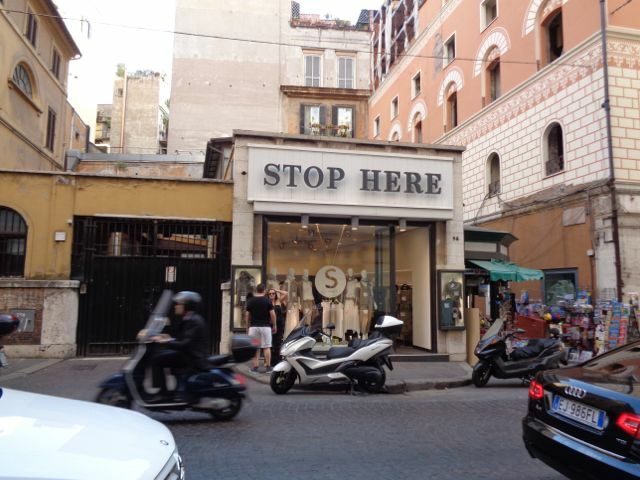 But, if a new store opened with an exotic Italian name, even if the translation was “stop here,” I wouldn’t know the difference. It might be hard to see, but it’s a clothing store. 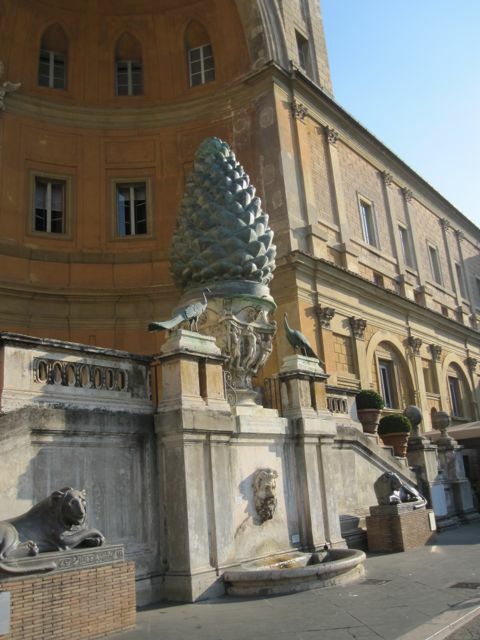 The pinecone (symbolizing eternity) in the Pinec0ne Courtyard in the Vatican. The lions at its base were “taken away” from Egypt during the time of the Roman Emperors. In fact, there are many Egyptian artifacts in Rome. There are obelisks everywhere. Several hundred years ago, the pope put an obelisk in front of every important church so the pilgrims would know which ones they should visit. Medieval GPS. Of course, before he could do that, he had to exorcise all of them to remove any evil spirits. Once that was done, a small symbol was placed on the top — a dove, a rose, a cross, etc. — to show it was purified. In modern times, when Egypt came calling and asked for all its obelisks back, the pope said they were now Christian relics and besides, they had spent much more time in Rome than they ever did in Egypt. Bottom line: Egypt isn’t getting its obelisks back. 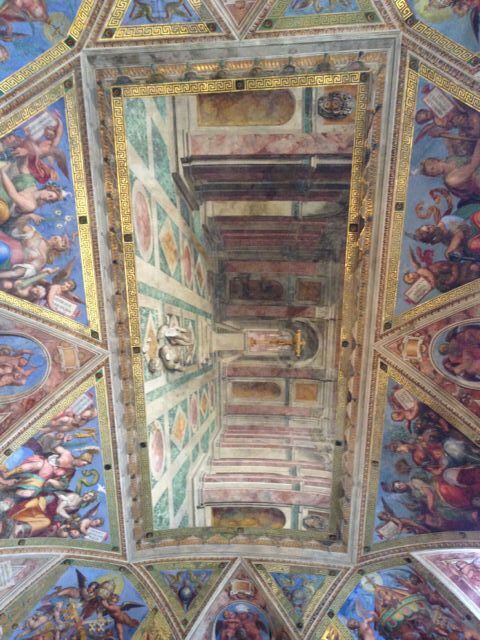 Just one of the many, many, painted ceilings and walls of the Vatican. It was overwhelming. A working courtyard at the Vatican. 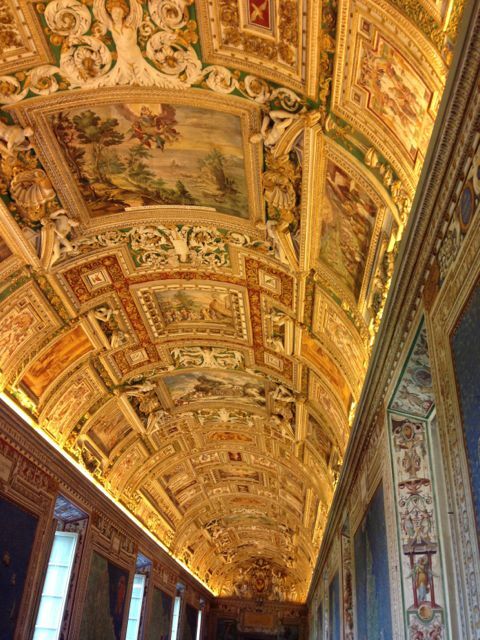 Everyday, about 900 people go to work at the Vatican. 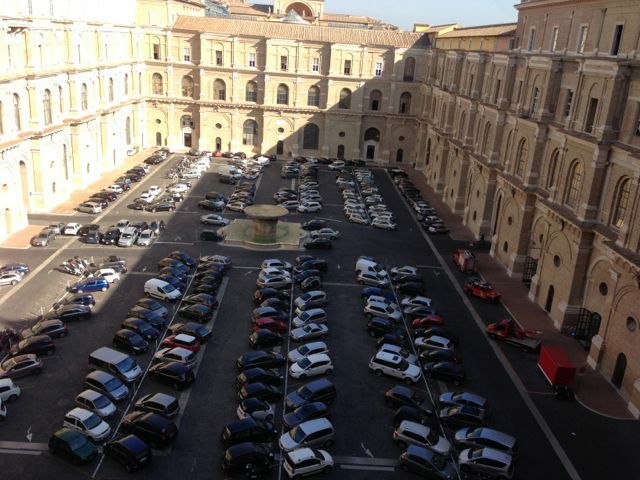 On the right you can see the vehicles of the Vatican’s fire department. I really liked this ceiling. This is the center, and the ceiling is completely flat. The depth, as well as the apparently molded dividers, are all paint and show the skill of the artist. In this picture, a marble statue of a pagan god lies in pieces at the foot of the cross. 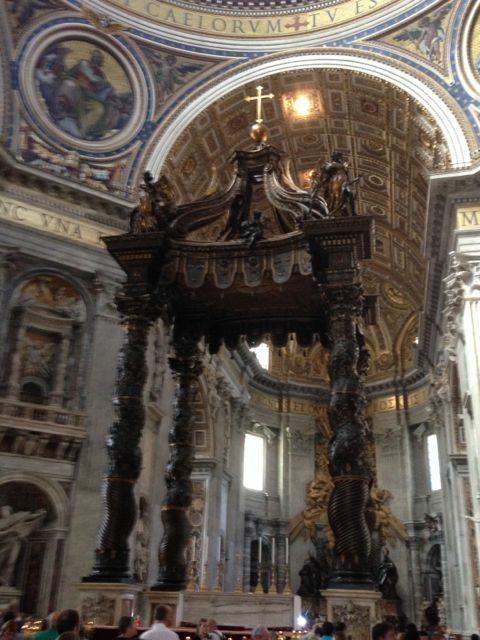 Inside St. Peter’s Basilica. The crowds were incredible. 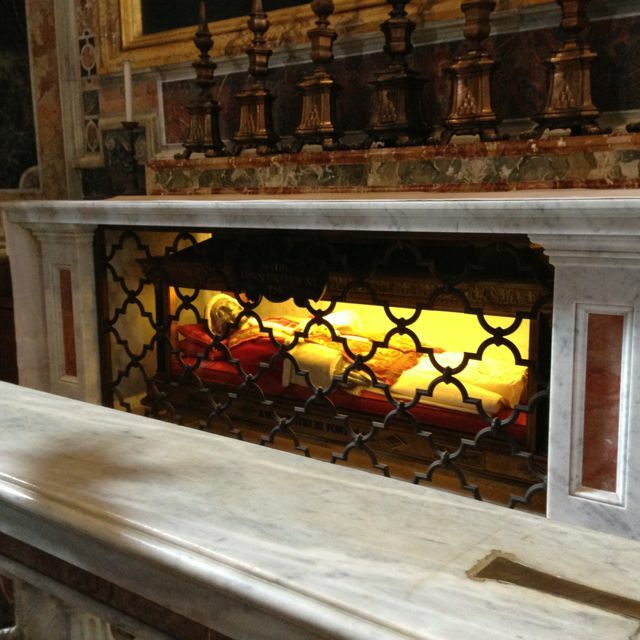 This is the tomb of Pope John Paul II, now a saint. His coffin is under the mantle with all the candles. This is the uncorrupted body of Pope John XXIII. This was as close as I got, but you can walk right past, if you want to. Another of the popes, this one covered in bronze. 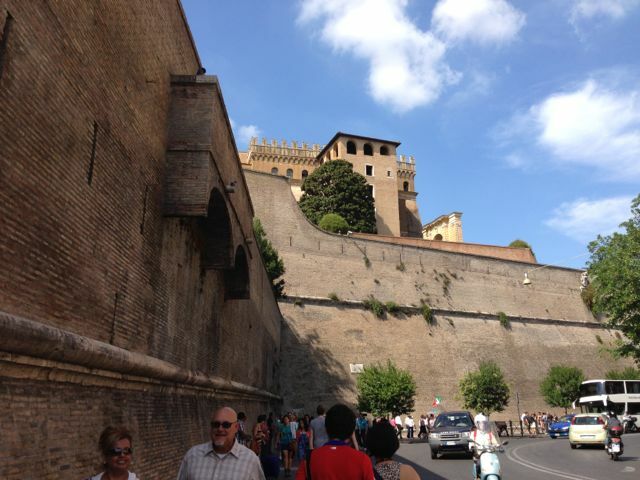 This is what the outside of the Vatican walls looks like. 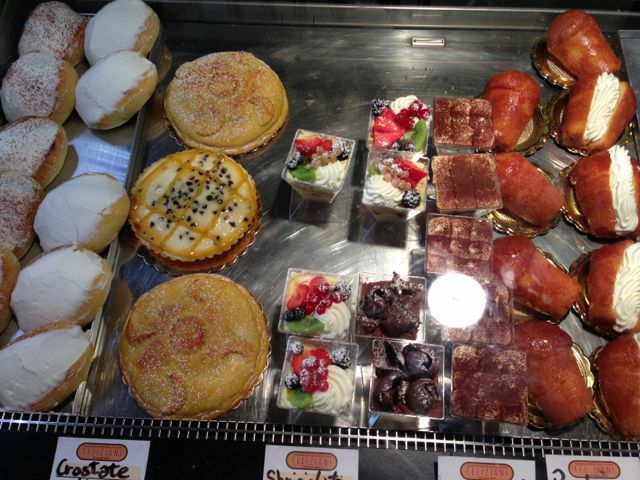 Pastries we found at lunch. I only tried a tiny little one, and it was fabulous.